The Wye One Way 50 mile ultra marathon is ominously close, so yesterday I jumped in the van at 6:30am and headed north to Glasbury on Wye to check out the last section of the course. It's highly likely that it will be dark when I get to this stage on the day of the event, so I wanted to be familiar with it. The countryside is beautiful in this part of mid Wales. Driving north, you leave behind the higher hills and enter into the stunning river valley. The Wye One Way route follows the Wye Valley Walk path for the most part, and includes flat sections alongside the river, and plenty of ups and downs along broad grassy bridleways on the hillsides, clocking up a significant 7648ft of ascent. 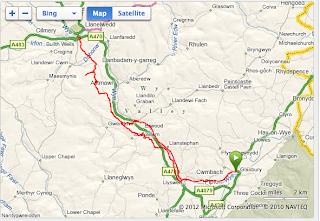 My run yesterday included the last 16ish miles of this route. The bridge I was supposed to cross at Llanstephan was closed to cars and pedestrians due to roadworks, so I diverted up onto the hillside and rejoined the intended route just above Erwood Bridge. I dropped into Builth Wells and realised how hungry I was! I've been packing just liquid and Soreen for my recent runs of up to 30ish miles, but having clocked 18 miles, eaten 2 slices of malt loaf, with just 2 slices left, it was apparent that I've become complacent about my food requirements. Builth delivered, and 2 cheese and onion pasties were bought, one was consumed and the other saved for later - just in case. A quick rejig of gear, and I was back on the trail, retracing my steps back to the van. The last section of the route, together with the diversion caused by the closed bridge, involved a lot of running of tarmac roads, and my knees and ankles were screaming by the end of the run, so much so, I conceded, and walked the whole of the last 2 miles (the mental demons were also at work by this point). 1. Food - need more than 4 slices of malt loaf if going over 30 miles!